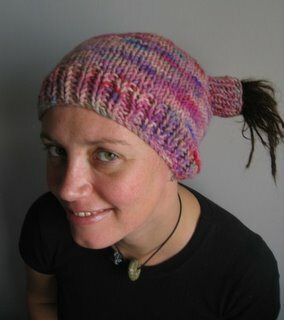 And another finished project - my pink 'Nippertales' hat (pattern from Magnits). Now, I'd knitted one of these previously as a pressie, and knew that I'd have to alter the pattern to fit my bunched dreads through the turtlenecks. I was using some hand-dyed wool that I'd bought from Handweaver's Studio at Ally Pally in a yummy pink colourway. Did the usual tension square and found that the yarn knitted up to 3.5 sts per inch on 6mm, rather than the recommended 5sts per inch on 5mm. So I had to recalculate the whole pattern. Not difficult, really, and it knitted up pretty fast. The yarn came in a 100g hank, and I've some left over for felted flowers. 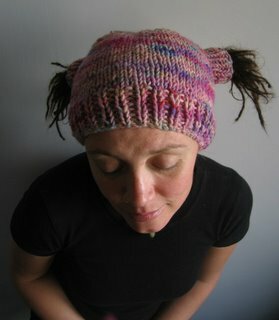 It's not a hat you can pull on and off super quick, as you do need to kinda adjust your pigtales. But nonetheless, I absolutely *love* it! It will join the rest of my collection and fit in rather well. Next up - a few more rows needed to finish the Executive Funk, then a skein to ball up for another not-to-be-disclosed pressie. I've the felt balls and jewellery to do more of and the techniques to post. The forgotten peg-loom sample? Waiting to be finished and felted. Then there's the plastic-bags-into-yarn techniques to post from yesterday's workshop. And I promised Hazel ages ago that I'd enlighten her and everyone else about how to use the knitting frame. Finally, I *must* email Anna and Amy. Such a busy girl!